So I found out yesterday that the Ludum Dare competition was Internet based (hooray for making assumptions!) and now I'm participating with the Ruby/Gosu crowd. If you are not familiar with the contest, it is a solo contest where you basically get a theme (Advancing Wall of Doom this time) then build a game from scratch (outside of several accepted frameworks for code). My idea is a combination of word play and sleep induced story. A friend of mine jokingly said something about "walla" which turns out is a word, and a city. As a word, it means the incoherent rumble of voice that comes from a group of people. It is also a city in Washington (Walla Walla). From that, my game is a "walla" zombies in Walla Walla. 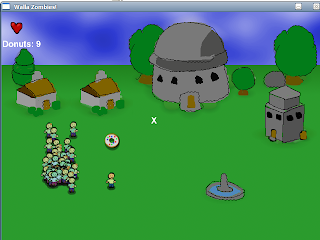 The point of the game is to survive a horde of zombies by running and tossing donuts (y'know cause zombies like donuts). Don't ask why donuts, I don't know. I was half-asleep when that idea came to mind. 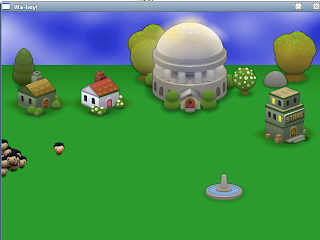 Now, the main character is a baker and that just happens to be all that he has on hand. For mechanics, the zombies move according to a vector field, ala Ronald C. Arkin's paper "Motor Scheme - Based Mobile Robot Navigation". The map is split into 10x10 pixel cells, with randomly initialized vectors pointing where to go. On each update, the zombies pick up this vector and move in that direction. There is a three in ten chance that they will just move randomly, adding noise to the field in case they get stuck, and to make their movement more erratic. If they are close to a target, they will build a local vector map pointing towards the target and update the map. If they are touching (very close) they will "hit" that object, which will either return 1 or -1 if that target is the player or a donut. This way they can gain health from players and lose from donuts. Over time, they will die on their own (starvation) which is the objective of the game. Because I like making things difficult, I decided on using a simple array based collision map. Normally, this is a fair idea but instead of storing this data in an image or something convenient I just used text. This is mainly because I don't have the RMagick gem installed and don't really want to install it. I would also rather keep my Ruby dependencies to a minimum as I don't want to make it difficult for any judges to run my game. My window is 640x480 pixels, which works nicely with a 10 pixel unit space. This leaves me to author a 64x48 array of ones and zeros. To keep from driving myself mad, I'm just going to limit my game to one map and design that map so that most of the space is solidly open or blocking. From the screenshots below, you can see that the horizontal middle of the map is where most of the action is. I've also extended the Image class in Gosu just to simplify calling draw with a bunch of re-used parameters, and also to enable simple animations for rotations and alpha changes. On my laptop (1.6 GHz Pentium M, 2GB RAM, ATI x300 radeon mobility) I can easily have fifty zombies running around. Though this slows down pretty significantly with the vector field updates when you toss out several donuts. There isn't a whole lot I can do about this, as the work is being done in Ruby and I don't really have time to write some C code to fix such a specific thing. For graphics and sound, I was initially going to use the sprites from lostgarden.com. However, using graphics not made by yourself is against the competition's rules. To cover this, I just traced over my background. Not really a good solution, but I'm fairly handicapped when it comes to art. Sound was built using GarageBand and sfxr both incredibly useful for projects like this. To introduce the game, I created a title sequence that shows a few screens giving the backstory (the little that exists). After that there is a sequence zooming into Walla Walla starting from a view from space. 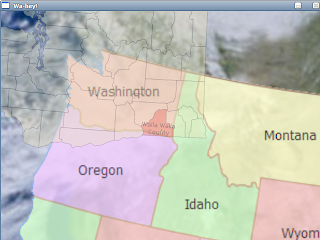 To do this in 2D, I found several images starting with a picture of Earth, a colored map of the United States, a map of Washington's counties, then a map showing Walla Walla within the Walla Walla county (I'm not making this name up, I swear). Without any further ado, here are some screenshots.